HENRY ROLAND, "The Human FlY"
The Davis County Courthouse has a special place in American entertainment history. It was there in 1924 and again in 1932 that a man -- a "human fly" in the lingo of the day -- tried to make his way up the side of the imposing building using only his hands and feet. There were no safety ropes. No net to catch him if he fell. Only the courthouse, the human fly and a large crowd that had gathered to watch the feat. What unfolded in front of the spectators is still talked about over seven decades later. The human fly was Henry "Dare-Devil" Roland, who was born in Germany on March 2, 1894. He immigrated with his family to the United States when he was 4 years old. Growing up in Pennsylvania, young Henry was captivated with trapeze acts he saw at the circus. He became proficient at balancing, tumbling, climbing. He also taught himself how to juggle. Even though he was a skilled welder, about 1915 he decided to join the circus as a juggler. After seeing Roland's climbing ability, an older member of the circus troupe advised him to go for the big thrill because it was a more fertile field. This period of his life is somewhat murky, with the exact details obscured by a liberal coating of P.T. Barnum-like hype, but somewhere along the way he heeded the performer's advice, took his climbing skills and hit the road -- traveling from city to city, scaling the outside of buildings and performing balancing routines on parapets. Occasionally, Roland would be booked to appear in order to publicize some business, but usually he would arrive in a city where a small newspaper ad had been placed or flyers had been distributed advertising scheduled climbs in the afternoon and again in the evening. Sometimes a stage performance at a local theater would follow the evening climb. In August 1924, Roland, his wife Anna and small daughter, Helen, were traveling across Iowa, performing and collecting donations in order to cover their travel and living expenses. He had postponed his climb at Waverly one day due to a heavy rainstorm. A week later, on August 27, the Roland family apparently made an unscheduled stop in Bloomfield, where the Davis County Courthouse beckoned. 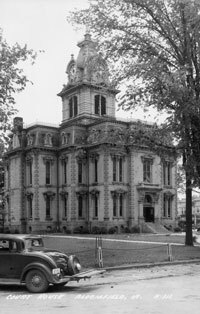 Unlike today, the courthouse squares and main streets of the typical Midwestern small town would hum with activity, well past supper. This summer evening in Bloomfield was no exception as several hundred people had gathered in the northwest corner of the courtyard to witness something they might normally expect to see only in newsreels at the nearby Iowa Theatre. Roland began his ascent at the northwest corner of the courthouse, outside the auditor's office. The climb went smoothly as he neared the cornice. Then suddenly the crowd witnessed him groping for a firm handhold as he swung around the corner trying to find a footing. Without warning, he shrieked and fell 35 feet to the sidewalk below, landing on his left leg, hip and arm. Dr. Henry C. Young, who had been in the crowd, immediately began to render medical attention. He had members of the audience carry the crippled fly to his office, for a more thorough examination. He found that Roland had broken his left hip, severely strained his back, and had banged up his left arm pretty badly. Roland was transported to the Wishard Hotel on the southeast corner of the square, where Henry Wishard had offered the use of a hotel room free of charge. The next day, the Bloomfield Democrat, recorded Henry Roland's attempt to climb the Davis County Courthouse with the headline: "HUMAN FLY FALLS TO GROUND. Hundreds of Horrified Watchers See Henry Roland, World Famous Fly, Fall and Break Hip." Dr. Young told the newspaper that Roland would be crippled for many months and probably would never be able to climb again. The article continued by telling of the plight of the Roland family who were nearly penniless and were now stranded in Bloomfield. The article pointed out that Mrs. Roland had to care for her little daughter, as well as her injured husband. In addition, the newspaper mentioned a fund that had been established, urging readers to extend the hand of Christian charity and listed those people who had already started contributing. Following a restless night at the Wishard, Dr. Young thought fresh air would make Roland more comfortable and had him moved to the tourist campgrounds located at Weaver Park, on the north edge of the city. Recovery at the campground was equally uncomfortable for Roland, and on Saturday morning he was transferred to the hospital in Ottumwa, where he would spend the next five weeks. Mrs. Roland accompanied her husband to Ottumwa. The Rolands' daughter, Helen, who had been staying with Dr. and Mrs. B.R. Stone since her father's accident, joined her mother on the following Sunday. Dr. Stone reported back to the Bloomfield Democrat that Roland was "rapidly recovering and feeling fine." The Roland family returned to Bloomfield during the second week of October and secured lodging with the P.E. Whited family on West Poplar Street. Mrs. Roland took small jobs trying to earn money, and local citizens would leave food for the family at Brunk's Grocery. By the end of October, Roland had recovered enough for the family to return to Pennsylvania by automobile. Doctors told Roland that his climbing days were over, but his determination to overcome his injuries was successful. His left leg was now a little shorter than before, but that did not cause him any problems when he climbed. His left arm lost most of its strength as a result of the fall, but lots of exercise and practice helped him regain his strength. He was back on the entertainment circuit the following year, making his first climb in Lorain, Ohio. As his daughter neared school age, he bought a home in Ohio to provide some normalcy for his family. He regularly performed near home, but he still traveled the country. He accumulated scrapbooks full of press clippings, but this time spent on the road took its toll on his marriage. In August 1928, his wife was granted a divorce. Over the years that followed, his travels took him from Washington to Florida, from Vermont to California and along the Texas coast, plus Mexico and Europe. Roland's act evolved during this time period. In Texas he had met his future second wife, Blannis, who eventually became part of his act. After he reached the top of a building she would join him and would ride his shoulders as he walked blindfolded along the ledge of the building or would take her ankles and dangle her above the spectators. 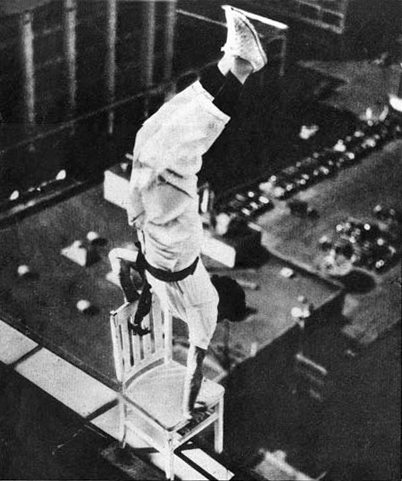 "Dare-Devil" Roland went on to win international fame with his chair-balancing act on top of the 22-story Roosevelt Hotel in Seattle, Washington. This city was also the site of the tallest building he claimed to have scaled, the 42-story L.C. Smith Tower. In June 1932, Roland was in central Missouri performing at Fayette and Moberly when he decided to cross the state line to erase the single blemish from his 18-year career as a human fly. 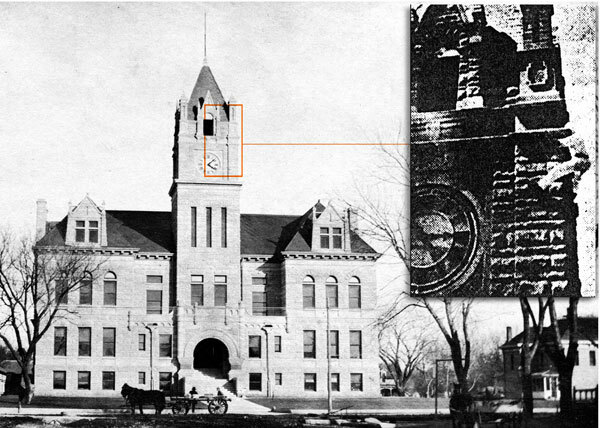 On June 29, he was in Bloomfield, where he hoped to thrill an audience of hundreds of people by attempting to successfully climb the Davis County Courthouse. This time the citizenry, fearing another mishap before a large audience, tried to dissuade him from such a performance. But he had come this far and was not about to leave Bloomfield without conquering his one failure, so he walked over to the courthouse and immediately started climbing. This time he made a flawless climb, pausing halfway up to do a handstand on the ledge. In less than 12 minutes he had placed his cap on the head of the Blind Justice statue that stands atop the clock tower. The following day, the Bloomfield Democrat wrote of Henry Roland's earlier near-fatal fall, his remarkable recovery and his successful return, "Wednesday he came back to Bloomfield to climb the 'nemesis' and to thank the people of Davis County for their kindness toward him and his family when they cared for him during his convalescence." He said that when he first returned to climbing his desire was to make it safer and talked about how he commissioned rope ladders he could use in case he should find himself in difficult circumstances, but he abandoned such ideas once he realized that his strength had returned. When asked about the hazards human flies face, Roland told the Democrat "they occur most times on small buildings. They get too confident on the easy jobs and do not take necessary precautions which they observe in climbing difficult structures." "Buildings with terra cotta walls are the most difficult to climb," he said, "Their slippery surface makes holding on a difficult job. Sharp corners, with a ledge of at least one and one-half inches are necessary to secure a firm hold, according to the daredevil." "If that old building could talk," he said after his climb yesterday, "I'll bet it would say, 'Roland you're a good climber after all.' "
Throughout his career, when Henry Roland gave interviews around the United States, he would mention that Bloomfield had been his only mishap. He usually embellished the account by stating that part of the cornice gave way or that a startled pigeon flew into his face, caused him to loose his grip. The Bloomfield newspaper's accounts never mentioned any pigeon or the cornice giving way. Perhaps he came closer to telling what had happened in Bloomfield that day back in 1924, during a 1933 newspaper interview with the Monitor-Index and Democrat newspaper in Moberly, Missouri. In the article, Roland said, "I intended to do a 'fake slip' halfway up the building to give the crowd an extra thrill, but I became careless and forgot to take a firm grip with my hands before I did it." In 1936, after years of traveling countless miles of dusty roads, Roland was seeking to create a new "big thrill." By end of the year he had perfected a sensational swaying pole-trapeze act and signed a 30-week contract with a carnival to perform his act throughout 1937. The act featured a 20-foot-tall pole that Roland installed on top of a 90-foot ladder. Sixty-two feet off the ground, a trapeze had been built, extending away from the ladder. Roland would ascend the ladder and climb the pole and do a series of handstands on top of the pole. Then he would make the pole sway back and forth as far as it would extend. Finally, he would release his grip and do a series forward somersaults down to the trapeze, 48 feet below. On October 8, 1937, at a small fair in Ottway, Tennessee, Roland went about his usual routine of meticulously inspecting the ladder's rigging. After about 15 minutes of going over everything, right on cue he ascended the ladder to begin his routine. This autumn day had brought winds that were stronger than usual, but he continued with his performance. Just as he released his grip from the pole to somersault down to the trapeze, the wind picked up and pushed the trapeze bar just enough to allow Roland to only get one leg over the bar. His wife shrieked as he fell 62 feet to the ground below. He was rushed through the mountains to the hospital in nearby Greeneville, Tennessee, where he was pronounced dead upon arrival. He was 43 years old. That brought to an end the unusual career of Henry "Dare-Devil" Roland, an entertainer who, with his acrobatic skills, amazed -- and terrified -- thousands of people on street corners and in courthouse squares across the country during a remarkable career that lasted for over two decades.